Conor McGregor wants his own $9 million trip to Japan. On Sunday night, the former two-division UFC champion sent out a message on social media asking for his shot at an exhibition match against 20-year old Japanese kickboxing prodigy Tenshin Nasukawa. “I wish to go to Tokyo to face Tenshin Nasukawa in a mixed martial arts exhibition bout,” McGregor wrote on Twitter. “Before this summer. Please arrange this, this instant. McGregor’s call out — joke or not — comes after Floyd Mayweather reportedly made $9 million for a three round exhibition boxing match against Nasukawa that took place on New Year’s Eve in Japan. On that night, Mayweather made short work of his undersized opponent, landing several knockdowns in the first round, which led to Nasukawa’s corner eventually throwing in the towel to prevent him from taking any more damage. Nasukawa, who is 5-foot-5-inches tall and typically competes around 125 pounds, talked a lot leading into the exhibition bout how he was going for the win but ultimately he was just out powered, out sized and out gunned against the legendary boxer. Well it seems like McGregor wants to follow in Mayweather’s footsteps — or perhaps he’s just mocking his former foe for taking the easy payday in a fight he was almost guaranteed to win. 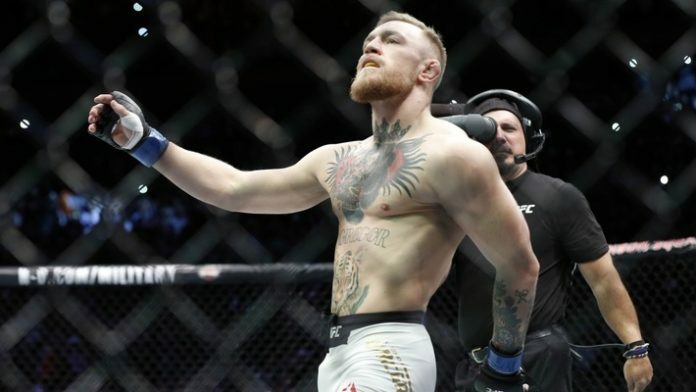 McGregor has been on the sidelines since October when he lost via fourth round submission to current UFC lightweight champion Khabib Nurmagomedov. Most recently, McGregor welcomed his second child to the world after his girlfriend gave birth to a baby, who now joins his son Conor McGregor Jr. There is still no word on when McGregor will make his return to the Octagon but he’s at least having some fun by calling out Nasukawa for an exhibition fight in Japan.